Following on the heels of his Exploring Our Voices & Harmony 4-week session, Jeff offers Getting Rhythm In & Out for ukers, drummers, dancers, & players of ANY instrument! 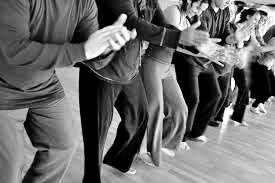 This is how we learn rhythm naturally, experientially, by embodying it. From the Life is a Whole Body Experience Sessions™ with Jeff Hanna, author of Life is a Whole Body Experience (unpublished). We’ll be chanting, stepping & clapping, then applying what we were creating rhythmically, to our instruments. For players of any instrument, because as you know, rhythm is the basis of all music! Perfect for drummers, dancers, singers, strummers, bassists, percussionists, you name it. Jeff Hanna, co-owner of The Rhythm Inlet & The Ukulele Place, combines his masterful teaching style, a background in singing & performing in small a-cappella groups, & decades as a hand-drum & world percussion educator & performer, with his love of music & a desire to inspire us all to find fun in making & discovering sound. Cost is $60, & includes your monthly Membership to The Rhythm Inlet & The Ukulele Place. Please check out & join the Facebook Event Page. Please check out & join the Meetup Event Page.